This medical laser chiller subsystem is designed specifically to integrate into a customer’s system, allowing simple installation in the field. The subsystem provides cooling in a compact design with focus on part minimization and affordable costs. 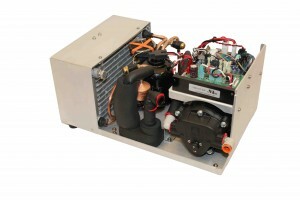 Compact subsystem, integrates directly with the customer’s assembly, providing full access to the cooling system. Over 300 W of cooling provided. Rapid pull-down to set point temperature. Designed to meet cost targets in moderate production. Aspen worked diligently with our customer to develop a compact chiller solution for a medical laser application. Driven to meet tight size and weight requirements, while minimizing cost and optimizing performance, this subsystem was the results of a collaborative effort between the two engineering teams. Operating on an accelerated schedule, Aspen designed, fabricated, tested, and delivered prototype units on time for integration with their prototype system. The subsystem consists of components designed by Aspen with components provided by the customer (control boards) to offer a truly integrated solution.